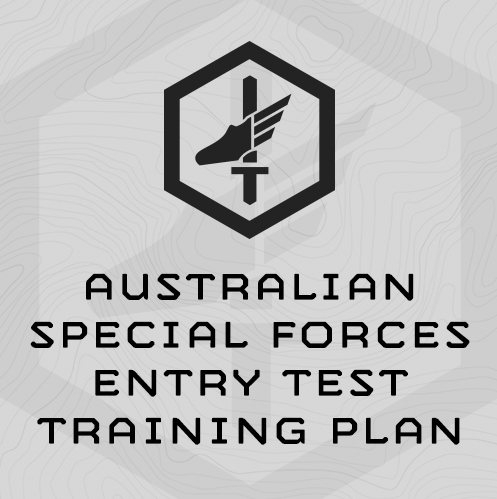 The following program is designed to prepare an athlete for successful completion of the Australian Special Forces Entry Test. There is no ‘passing’ score for the events in the Special Forces Entry Test. Your results will be measured against your peers, so it pays to be as prepared as possible for the individual events. Below is a list of the events for the Special Forces Entry Test – all events are conducted in one day. The training program deploys the scored events on the Monday of Weeks 1, 3, and 6, and uses your latest event scores to scale the workouts to your fitness level for the follow-on progressions. In this way the plan automatically scales to the fitness of the individual athlete and continues to push them as their fitness improves. It’s designed specifically to improve results on graded events. Complete this plan 6 weeks directly before your Special Forces Entry Test date. Week 6 is a deload week. Do the sessions in the order written. Don’t skip ahead. If you’re less than 6 weeks away from the test date, begin at Session 1 and progress as far through the program as you can. If you miss a day, make up the session you missed the next day and follow the programming as prescribed. If this happens, we recommend training on a Saturday to stay on schedule. Can I see some sample training? Click the “Sample Training” tab above to see the entire first week of programming in the plan. You are encouraged to do it before purchasing. You may conduct the ruck and swim later in the day if required. 200m Swim using the Breast Stroke or Side Stroke. Use the same stroke for all rounds. Part (1) & (2): Ensure you are conducting Push Ups and Pull Ups to the cadence timer set to 30 BPM. Example: You rucked 10km during the SESSION 1 1.5 Hour Ruck Assessment. Step 1: Find your per kilometer pace by dividing your max distance (10km) from the 90-minute ruck assessment. (90 min/10 = 9:00 min/km). Now subtract 20% from the per kilometer pace. You will need to break it down into seconds. 9:00 min is 540 seconds. 20% of 540 = 108. 540 sec. - 108 sec. = 432 sec. 432 seconds converted to minutes (divide by 60) is 7:12. So 7:12 min/km is your pace. Your interval distance will be 3.3km with a goal interval pace of 7:12 min/km. For this training session, you will ruck run 3.3km with a pace of 7:12min/km. Rest for 8 minutes, and then repeat at the same distance and speed. 800m Run wearing 8kg webbing gear + 4kg sledge or dumbbell @ Interval Pace using the MTI Running Calculator and results from SESSION 1 3.2km Run.